Hyderabad. In April 2018, ZF will officially open its new Innovation Hub in Hyderabad, India. It is already active and partnering with the “Nasscom Center of Excellence – IoT (CoE IoT),” a start-up initiative of the national IT industry association Nasscom and MeitY (Ministry of Electronics and Information Technology). As a result, ZF is able to network more broadly and closely with the Indian start-up scene. In turn, it benefits from easier access to the expertise of one of the largest automotive suppliers worldwide. In addition, the Innovation Hub sponsored a pitch event with a first look at ZF’s future start-up involvement on the ground on November 9, 2017. 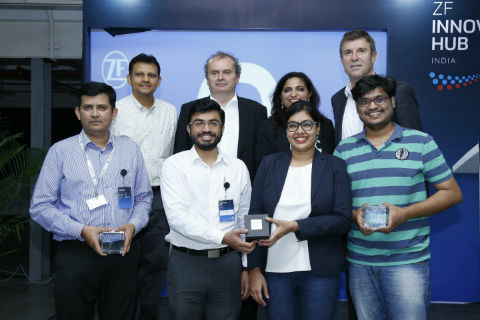 An initial taste of upcoming activities of the new ZF Innovation Hub was provided on November 9, 2017, in the form of a pitch event in which 12 Indian start-ups took part. They presented their solutions for the topics of electrification and new mobility, big data and analytics, connectivity as well as well as artificial intelligence (AI). In the end, Gayam Motor Works, LightMetrics, Merxius and Cyrrup were declared as the winners. They convinced with their ideas. Joint teams are now working hard on further developing these ideas. The Innovation Hub in Hyderabad is already the second to be founded by ZF this year. In August 2017, the technology company opened its counterpart in Silicon Valley, California.